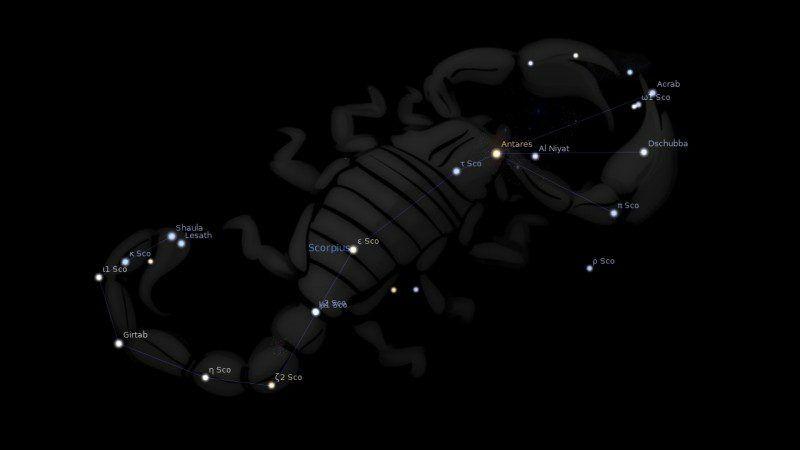 Constellation Scorpio the Scorpion, is an ecliptic constellation laying between constellation Libra and constellation Sagittarius. It spans 30 degrees longitude in the zodiac sign Sagittarius. 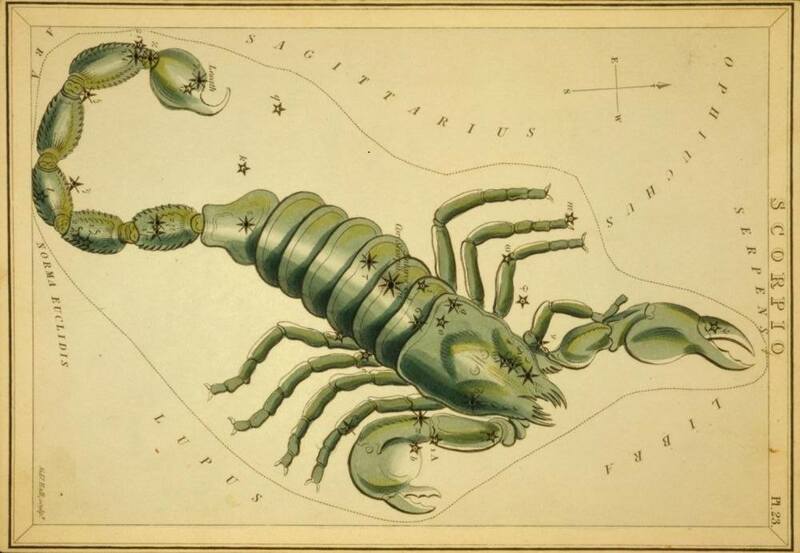 The Scorpio constellation contains 15 named fixed stars. Scorpio, or Scorpius, the Scorpion was the reputed slayer of the Giant (Orion), exalted to the skies and now rising from the horizon as Orion, still in fear of the Scorpion, sinks below it; although the latter itself was in danger. Classical authors saw in it the monster that caused the disastrous runaway of the steeds of Phoebus Apollo when in the inexperienced hands of Phaethon. For some centuries before the Christian era it was the largest of the zodiac figures, forming with the Khelai, its Claws, — the prosectae chelae of Cicero, now our Libra, — a double constellation, as Ovid wrote: Porrigit in spatium signorum membra duorum; and this figuring has been adduced as the strongest proof of Scorpio’s great antiquity, from the belief that only six constellations made up the earliest zodiac, of which this extended sign was one. The Akkadians called it Girtab, the Seizer, or Stinger, and the Place where One Bows Down, titles indicative of the creature’s dangerous character; although some early translators of the cuneiform text rendered it the Double Sword. With later dwellers on the Euphrates it was the symbol of darkness, showing the decline of the sun’s power after the autumnal equinox, then located in it. Always prominent in that astronomy, Jensen thinks that it was formed there 5000 B.C., and pictured much as it now is; perhaps also in the semi-human form of two Scorpion-men, the early circular Altar, or Lamp, sometimes being shown grasped in the Claws, as the Scales were in illustrations of the 15th century. In Babylonia this calendar sign was identified with the eighth month, Arakh Savna, our October-November. 1. Fixed Stars and Constellations in Astrology, Vivian E. Robson, 1923, p.60-61. 2. Star Names: Their Lore and Meaning, Richard H. Allen, 1889, p.360-364. 3. Astronomica, Manilius, 1st century AD, book 4, p.239-240, 253. 4. The Witness of the Stars, E. W. Bullinger, 9. Scorpio (the Scorpion).